I have read quite a bit about this mysterious pain syndrome that has affected over ten years of my life and recently I read a review from the Cochrane Library site that clarified something for me. Here, see what you think. In all of my reading, the low numbers involved in various studies have given me pause, but the Cochrane Library actually considers many studies to contain bias in the study structure. Not to mention, of course, there just aren’t that many of them. It is no wonder that little progress has been made in even the very first step our Burning Mouth Journeys…diagnosis. I don’t mean to lower your spirits or hope. We should have both, but unlike other neuropathic pain syndromes that have celebrity spokespeople, foundations or nonprofits to raise money for research, or even a decent percentage of name recognition in the medical community, Burning Mouth Syndrome has none of these. We only have a website that posts credible, updated information after review and coping strategies because volunteers pay for and maintain it. We only have Facebook support groups (some more evidence-based than others) because volunteers have created and donate their time and energy to fostering them. What can we do about this? Here’s one suggestion that will be easy for some and very difficult for others. 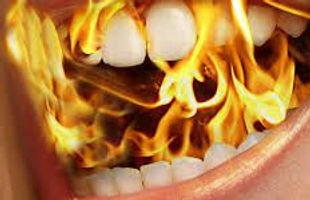 Take the time to explain what you know about Burning Mouth Syndrome to your friends, your family, your Facebook, Instagram, or other social media circles, and raise awareness. I have lost count of the doctors, specialists, friends, and colleagues I have educated about this chronic pain and I know there will be many more. You never know when that casual conversation you have with someone about BMS may turn into a critical contact that will lead a researcher to this particular disease, encourage another sufferer you don’t even know, or simply erase one more blank stare in the general population as they discover someone they know, or maybe even love, deals with BMS and just never talked about it with them. Try it, and let me know how it goes. As it stands, we have nothing to lose. The day I have feared for so long has arrived. I recently lost a crown on a lower molar that had a root canal so many years ago I don’t even remember which dentist or endodontist did it. However, he did not do it well and now I am looking at having to undergo a second root canal on it before my present dentist will put a new crown on it. In order to take advantage of the dental insurance we have through my husband’s job, that root canal will have to happen this year. I know many of you out there lack that luxury and I am sorry. Even with insurance, the temporary crown was not covered and cost over $500. I know there are families out there who do not have that to spare, and their decision might have been to continue to suffer and end up with a tooth extraction eventually. But beyond the cost element, for those of us who suffer from Burning Mouth Syndrome, we know there will be yet another price to pay.